New presidents always raise hopes as they enter office. But now it seems that there could be significant consequences if President Donald Trump fails to deliver after lifting spirits and stock prices so much. He’s even acknowledged the situation on Twitter. Trump is taking credit for the stock market rally and seems to be promising tax policy that is going to make things even better. The chart below shows that management teams of S&P 500 companies are talking about tax policy, and they are indicating they expect changes. After releasing earnings, management teams hold conference calls with analysts to explain the numbers and discuss their outlook for the next few months. These calls are recorded and can be analyzed for broad trends. In the current quarter, fewer companies than average lowered earnings expectations. This is bullish. But that’s just part of the story from the conference calls this quarter. 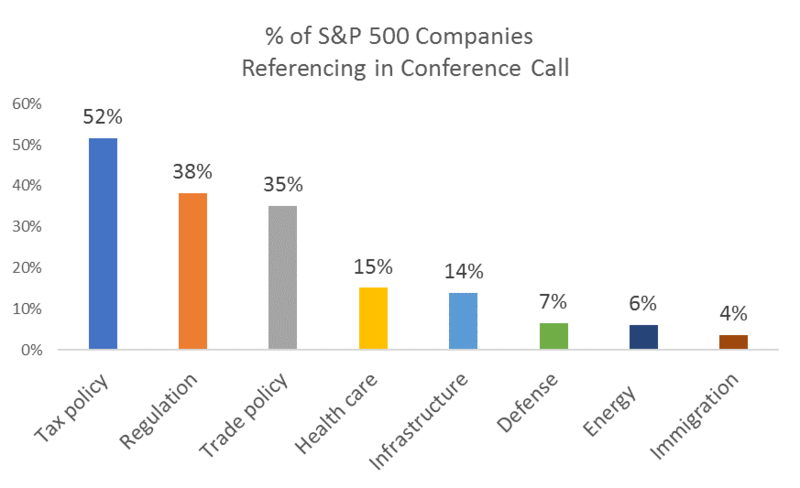 More than half of the companies in the S&P 500 holding these calls mentioned Trump or the Trump administration in their calls. Among those companies, tax policy is their primary concern, with 52% citing expected changes as a reason earnings forecasts could change. Changes in regulations, specifically lower costs associated with compliance, were mentioned by a third of the companies, and trade policy is also on the minds of many management teams. Trump has also raised hopes on Main Street, according to the National Federation of Independent Business (NFIB) Index of Small Business Optimism. The index jumped sharply after the election, buoyed by hope that change was imminent. These are small businesses that are often cited as the economy’s leading source of job creation. A majority of the businesses surveyed have less than 10 employees. Small-business owners report that their three biggest problems are taxes, regulations and finding quality employees. They hope Trump will address all three. Trump has promised to lower taxes, cut regulations and improve the education system, which would increase the quality of workers. 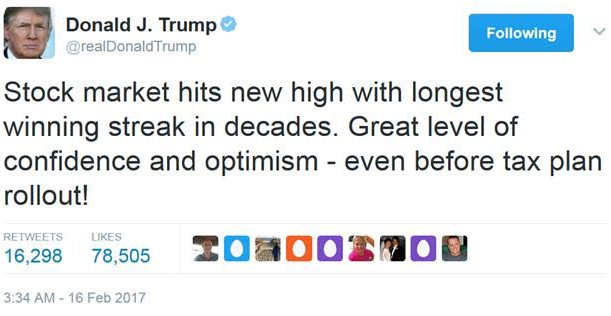 Those promises explain the jump in the Optimism Index. The Return of Smaller Government? This observation, intended to explain why economic growth is low, actually explains the reason for optimism about the economy. Policies put in place after 2009 to combat the recession largely consisted of new, expensive regulations. The Dodd-Frank Act added regulations to the financial sector that seemed to limit access to credit for small businesses. It also increased consumer costs for using debit cards and made free checking accounts almost impossible to find. The Affordable Care Act (ACA) also hit businesses hard. The ACA raised the costs of employee compensation for many businesses, and it hurt sales by lowering consumer discretionary income with a mandate to purchase high-cost health insurance policies. Election results delivered a pleasant surprise in the eyes of investors and business owners who, for the first time in eight years, saw the possibility of less government. 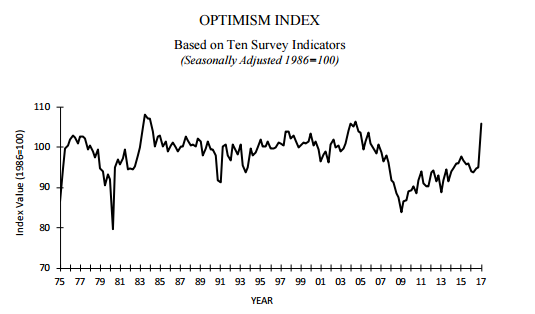 That optimism fueled rallies on both Wall Street and Main Street. Business owners and management teams at the largest companies in the world now need to see action. From Trump’s tweet, it appears the first test will be tax policy. If Trump fails to deliver on taxes, we are likely to see a pullback in business spending and sub-2% economic growth. Much is riding on Trump, and businesses, both large and small, are along for the ride.